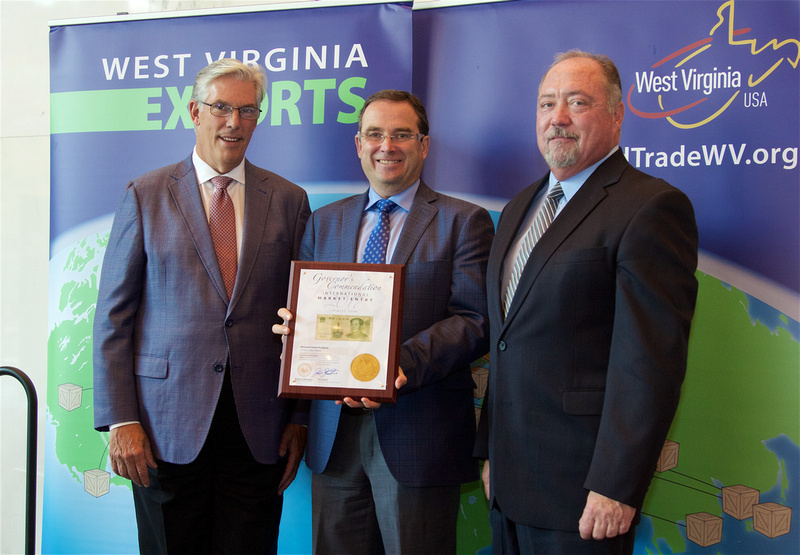 On November 4, West Virginia Governor Jim Justice commended our Fairmont mill for exporting recycled bleached kraft pulp to China. Noting that more exports mean a stronger economy and support for local jobs, Governor Justice presented Resolute, and 33 other companies, with the Governor’s Commendation for International Market Entry on behalf of West Virginia and the U.S. Department of Commerce. The Fairmont mill has an annual production capacity of 218,000 metric tons of recycled pulp, a green alternative designed to replace virgin fiber. Valued for its high quality and superior performance, recycled pulp is used in a wide variety of paper products and packaging applications. For more information, visit the press release. From left to right: Secretary of Commerce H. Wood Thrasher, West Virginia, Gerry Clapperton, General Manager at Fairmont RBK pulp mill, Resolute Forest Products, and Brad Morgan, Engineering Maintenance Manager at Fairmont RBK pulp mill, Resolute Forest Products.